Major Price Reduction! This Sabre 48 Salon Express is a must see vessel. Freshwater vessel for much of her life. Engines under warranty until 7/2018. Loaded with options including upgraded 600 H.P. QSC Cummins, Zeus pod drives w/joystick piloting, Skyhook electronic anchor, Freedom Lift for dinghy, twin Garmin 15" GPS w/HD radar, AIS, and satelite weather. She also has a custom SureShade for cockpit shade. With satellite tv throughout her three staterooms, she is easy to enjoy. All services are up to date. This is a turn-key vessel. Please contact the listing broker to arrange your private showing. United Yacht Sales New Jersey would love to guide you through a personal showing of this 48' Sabre 48 Salon Express 2012. 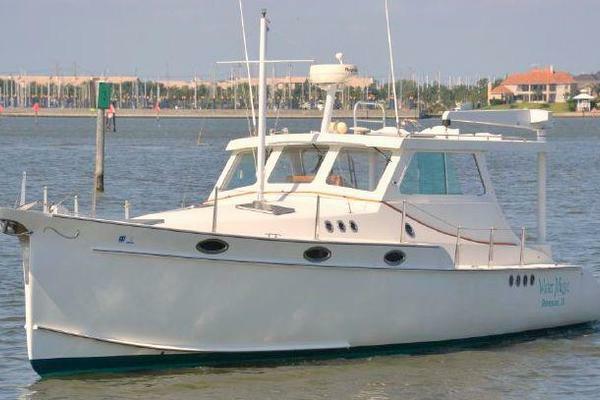 This yacht for sale is located in Ft. Myers, Florida and priced at $749,500. For a showing please contact us by filling out the form on this page and we will get back to you shortly! As an early adopter of pod drive systems, Sabre Yachts has a clear understanding of how these revolutionary drives can best be used to increase efficiency, maximize ease of operation and owner confidence. The all-new Sabre 48 Salon Express is our fifth pod driven model and she takes full advantage of this technology in both her performance and in her interior accommodation plan. The 48's traditional exterior profile belies the contemporary performances of her vee-hull. With the Zeus pod drive system, turns at speed are as exciting as they are in a fine sports car but perhaps even more exhilarating is the quiet that one experiences at cruise speeds. Less than 75 Dba makes her one of the quietest motoryachts available today. The joystick and Skyhook operations give every Captain the confidence to dock her in the most difficult of circumstances. Her raised cockpit sole brings together the social aspects of the cockpit and main salon and the aft end of the house opens up fully to connect the spaces. Her main salon offers ample seating surfaces for entertaining or simply relaxing to read or enjoy the standard entertainment systems. While underway the raised settee to port of the Stidd helm chair is a perfect place for the crew to enjoy the ride. And when docking, a standard side deck door serves her helmsman and crew, well. The two cabin, two head layout is supplemented by a mechanical space forward of the engine room. Optionally, this space can be laid out as a crew quarters with berth and head unit.